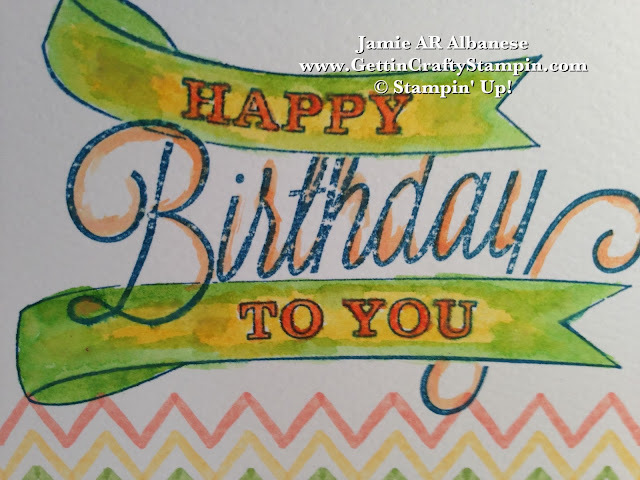 Send some colorful, bright birthday wishes with this hand-stamped, water-colored, fast birthday card! Did YOU Miss Out on my Watercolor Wonder Card Class?? DARN!! We had a ton of fun!! This collection of pre-fabbed watercolor note cards are STUNNING!! Create stunning cards and have fun using them to watercolor and more! These are one of my Favorite things about the new Occasions "Let's Celebrate" Mini Catalog! Don't miss out on future classes, see all that are available and RSVP ASAP (see how to get the classes for FREE!). ~ The patterned card stock base is on both sides of the card! ~ 20 cards of 4 of 5 different designs to meet so many needs!! ~ They coordinate with the Watercolor Wonder Designer Series Paper. 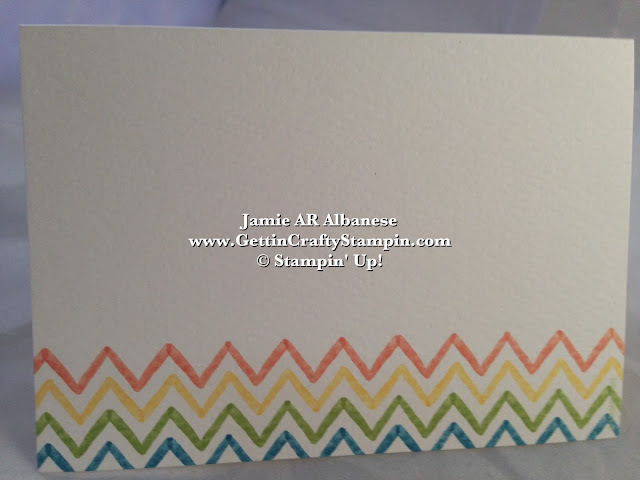 This pattern on the card is so fun! It says festive and I couldn't resist water coloring this beautiful card. Have fun creating this fast but bright card and send some cheer! See all the wonderful products in our award winning Catalogs! With Sale~A~Bration going on through March 31st see the FREE stamps, papers, tools, and more that are available!! Stamping this beautiful and bold birthday greeting, from the Another Great Year stamp set, with Island Indigo ink on the card. Create a collection of the ink when you squeeze the lid onto the closed ink pad. Open for a dollop of ink that is ready to use with your Aqua Painter. 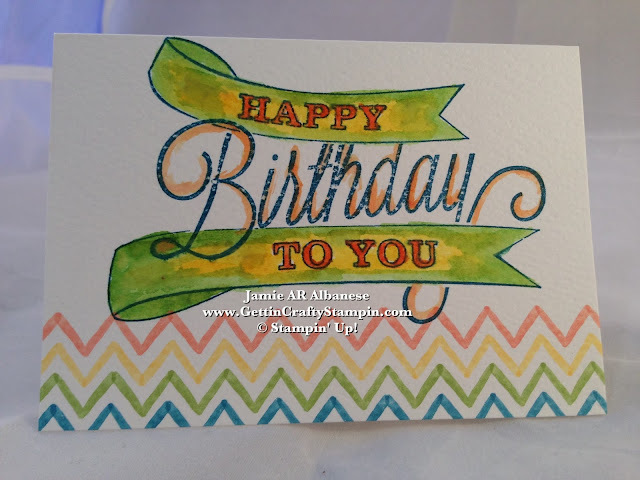 Easy, fun, colorful and beautiful.. this card is a great way to send ANYONE a Happy Birthday wish!! You can see, I've added shadowing in the words, and water colored for a wow card. Always start coloring the lightest color and work your darker color into the project. This Watercolor Wonder Designer Note Card is an ideal base, the water color paper is primed for a rich, color highlighting base. 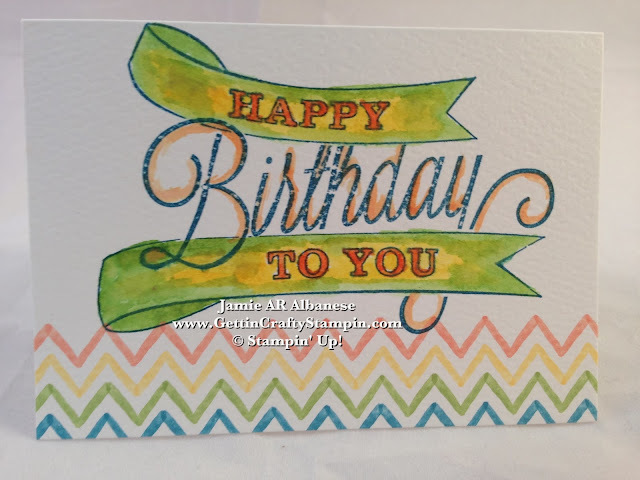 It is NOT limited to water coloring... you can stamp, punch, emboss and more on this card, too! Send a hand stamped, water colored card that is sure to add color and joy to anyone's day! This colorful card making class was packed with cool techniques using the new Water Color Wonder Designer Note Cards. Do NOT Miss Out on Upcoming Card Classes, Join Me by RSVPing ASAP! This colorful card is a warm, bright way to say Happy Birthday! From a child, to an adult (male, female, young or old) this card is sure to deliver a ton of smiles!